Pringle, A.. "Criminal Code". The Canadian Encyclopedia, 28 December 2014, Historica Canada. 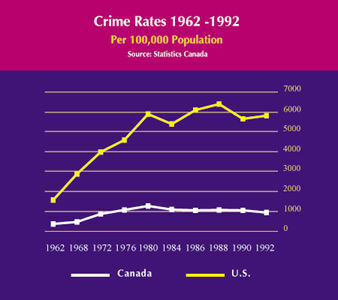 https://www.thecanadianencyclopedia.ca/en/article/criminal-code. Accessed 22 April 2019. Criminal Code, a federal statute enacted by Parliament pursuant to s91(27) of the CONSTITUTION ACT 1867, which provides the federal government exclusive jurisdiction to legislate criminal offences in Canada. Criminal Code, a federal statute enacted by Parliament pursuant to s91(27) of the Constitution Act 1867, which provides the federal government exclusive jurisdiction to legislate criminal offences in Canada. The Criminal Code contains most of the criminal offences that have been created by Parliament; however, some other criminal offences (for instance, narcotics offences) have been incorporated into other federal statutes. The Code not only defines types of conduct that constitute criminal offences but also establishes the kind and degree of punishment that may be imposed when an individual is convicted of an offence and the procedures to be followed throughout the criminal process (see Criminal Procedure). Based on a proposed codification of English Criminal Law (which was never enacted in England), the Criminal Code was originally enacted in 1892. It has never been fundamentally revised, although there were consolidations in 1906, 1927 and 1953. The 1953 consolidation was an attempt to reorganize, clarify and reconcile internal inconsistencies. More significantly, this consolidation abolished all Common-Law offences (ie, those created by case law rather than by a statute) while preserving common-law defences, justifications and excuses. Amendments to the Code have been made almost yearly to keep abreast of technological, social and economic changes in society (eg, new offences being created such as theft of telecommunications, use of credit cards and hijacking of aircraft, and changes with respect to existing offences such as those that have recently occurred with respect to sexual assaults and impaired driving offences). The first portion of the Code consists of enactments of general principles followed by parts (several sections each) creating offences that are grouped under different categories such as offences against the person, offences against property, offences against the administration of law and justice, sexual offences, currency offences, and conspiracies. The rest of the Code is concerned with procedure and sentencing. It is estimated that 40% of the Criminal Code deals with criminal law procedure and the remaining 60% with the definition of criminal law offences, the codification of some of the defences that are available to criminal charges, and finally sentencing options available to judges. The Code has been severely criticized, however, for failing to reflect the attitudes of the majority of Canadians. Though the Canadian Law Reform Commission was dismantled in 1993, a bill was proclaimed law in 1996 which significantly amended the Criminal Code regarding sentencing. Historically, the criminal law has treated a crime as a wrong against the community as a whole rather than against the individual victim. As a consequence, individual victims of crime have often felt outside the criminal justice process. The new legislation amends the sentencing provisions of the Criminal Code so that the courts are now required, when deciding an offender's sentence, to consider written statements of victims which describe the harm done to them for the losses they have suffered. The courts will enjoy a wider discretion to order restitution or compensation from an offender to the victims of a crime and these orders will be enforceable through the process of civil execution. The changes to the Code will also allow the courts to play a more active role in the rehabilitation of an individual offender. Alternatives to incarceration will be more readily enforced. For instance, the new "Conditional Sentence" allows a judge to impose a term of imprisonment but permits the convicted offender to serve this sentence in the community on conditions which will allow supervision of the offender within the community and thereby increase the likelihood of his or her rehabilitation. If the offender fails to live up to the conditions imposed he or she can be made to serve the outstanding portion of the jail sentence. Also provided for under the new provisions are "Alternative Measures" for adult offenders which permit the diversion of an offender away from criminal prosecution and directly into rehabilitative programs or community service. The new sentencing provisions are designed to respond to a growing attitude in society that the interests of victims of crime should have a more prominent place when an offender's sentence is decided. It is also recognized that prison should be something of a last resort, justifiable only when necessary in the public interest or as a means by which to denounce serious offences.